But this still does not answer all the questions banks have on how to approach these third parties. While the mindset has shifted from fintechs being competitors to partners, banks still need to define what these third parties really are to them; friend or foe or ??? In fact, the answer to that question has been staring us in the face the whole time: the third party providers are an entirely new type of customers for the banks. Yes, they do service the bank’s end customers too, but they are a new customer segment that requires a different set of products and services and approach. Fintechs do not need the same products as retail or corporate customers, but they do need products and services nevertheless. Because of PSD2, banks will be mandated to expose payment initiation and account information services to regulated third parties. By now the industry also understands that it is key to look beyond basic compliance, extending the offering to non-regulated third parties and broadening the scope to value-added products and services for both regulated TPPs and fintech partners. There are various domains where banks can create additional products and services for this newly created customer segment, ranging from onboarding of third parties, certification of applications, test infrastructure, support and developer community management, but also fraud, dispute management, identity, age verification, alias resolution and so much more. Since these all go above and beyond PSD2 compliance, banks have an opportunity to define commercial models around these products, creating new revenue streams. As with any customer segment, it will be important for banks to attract and retain these customers. This will require banks to collaborate with fintechs to learn what these customers really need in order to build innovative new solutions around the bank’s APIs. Being able to access convenient third-party services built around their bank accounts will be extremely valuable to the bank’s retail and corporate customers, and build a richer, bank experience that fits in today’s open world and business climate. There has been a lot of discussion on the threats and opportunities for the banks in the context of PSD2, but the real opportunity lies in this new API customer segment. It’s a brave new world for those who dare! 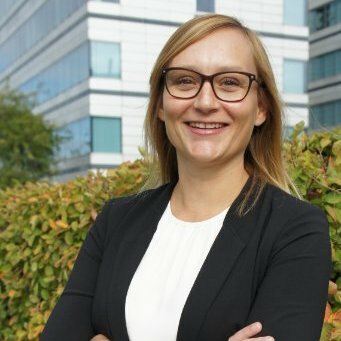 The thread that has run throughout her career so far will be the core focus for Marijke Koninckx’ role at BankiFi as well: helping companies to better understand complex market and customer requirements and translate that into a successful product and go to market strategy. She most recently worked as Product Manager on Real-time Payments and Open Banking. Marijke is a key contributor to the Open Transaction Alliance, an industry working group on PSD2 and XS2A.